King County Elections reports that ballot drop boxes continue to be a convenient option for King County voters. About 390,000 ballots were returned through drop boxes during the 2018 General Election. The Ballard Branch Library location was the most popular, with 19,034 ballots returned there. This was the first general election where King County provided prepaid postage for ballots. That resulted in more voters using the mail to return their ballots. About 60 percent of ballots were returned through the US Postal Service compared with 40 percent brought to drop boxes. Drop boxes remain popular with last-minute voters. 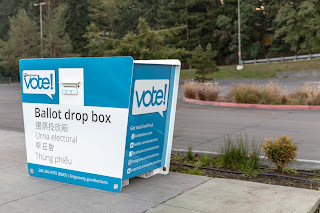 A majority of drop box ballots were submitted on Election Day (183,000) and the day before (50,000). King County made it even easier to use a drop box this election by opening five new sites: Alaska Junction in West Seattle, Magnuson Park/The Brig, Redmond Community Center at Marymoor Village, Shoreline Park and Ride, and Waterway 19 Park in Fremont. There are now 66 drop boxes county wide.